It may be easier to just build a bonfire in the backyard and wing it the old-fashioned way. However I can already predict that horrible tragedies that would come out of that attempt! Did I ever tell you how much I actually have always wanted to build a small fire pit in the yard? That would be so heavenly, to sit around the fire on a summer night. I’ve seen so many easy-looking Pinterest DIYs for it, but just never “asked” the parents if this could be done. You just need to dig out a circle and place some nice stones. Nothing fancy! I guess it will just have to be one of those things I do with my own house, along with that garden! If you have a fire pit, just know, I’m jealous 😉 Invite me over and invite someone who has a stand mixer so we can whip up some gluten-free, vegan, soy-free marshmallows! But before dessert. let’s talk chicken! I think the rankings of chicken-cooking-methods are grilling, slow cooker, and then baked. Sadly, I have been stuck with the latter, but I still have some good grilled recipes to share, like this one! I used my favorite garlic again, but added a new zesty flavor as well. Coriander! If you ever find yourself with out a lemon and need that lemon flavor in a dish, just throw in a bit of ground coriander! It really brightens any dish and does taste lemony, less like cilantro which is comes from. 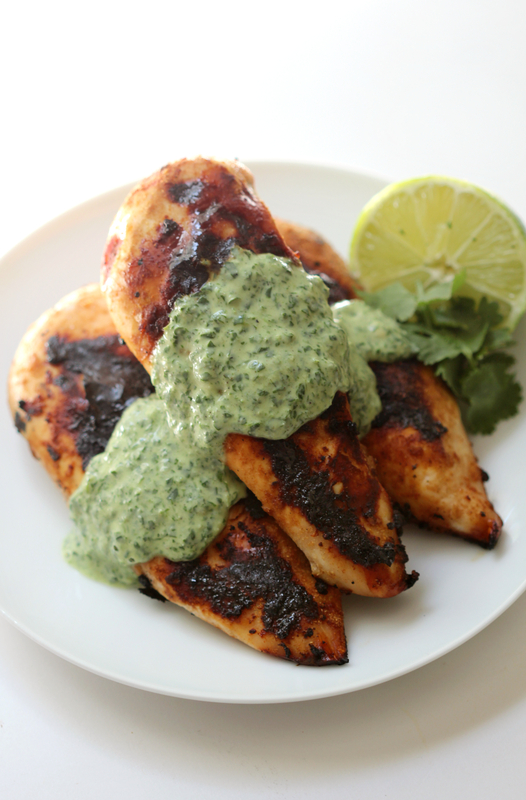 I then paired this coriander garlic smoky chicken with my first take on a green goddess sauce. I looked into what exactly “green goddess” meant, and came back with this. Green Goddess Dressing was first used in San Francisco’s Palace Hotel restaurant and it contained mayo, sour cream, herbs, lemon juice, and anchovies. It was widely popular in the 70s and 80s, but since then, it has been recreated in so many ways, by so many people, you can find 183737492 versions now on the internet. Well, to me, that original dressing sounded kinda gross, so I made it better and to my liking, which tastes pretty amazing (just saying) 😉 I’ve never had (and will never) have the classic Palace Hotel Green Goddess, but the one I’ve whipped up is all I’ll be needing anytime soon! When you combine fresh basil, cilantro, tahini, coconut milk, lime, garlic, onion, and a dash of pepper, you’re going to get one damn good dressing (or sauce as I’m calling it!). It’s hard to describe how this chicken tasted with the sauce included. I think this is where the term umami comes in to play. It was savory, but zesty, creamy, a bit nutty from the tahini, basically all taste sensations combined. With the overall outcome of WOW. I may also just be the worst person at describing the way foods taste (goodbye food critic career), so I’ll just let you make the recipe and let you tell me how you think it tastes yourself! The lemony tang of coriander with savory garlic, compliment the smoky taste of grilled chicken perfectly. Add a green goddess sauce full of herbs, tahini, coconut and lime to brighten this gluten-free and paleo healthy dinner entree even further, enticing the taste buds. For each chicken breast, rub in the specified spice mixture all around. Place the chicken breasts on an oiled piece of foil or directly on a pre-heated grill. Grill (covered) for 10-12 minutes, flip each breast and grill another 10-12 minutes or until the chicken is done. Meanwhile, in a food processor, combine all the green goddess sauce ingredients. pulse and blend until you get a smooth green sauce. 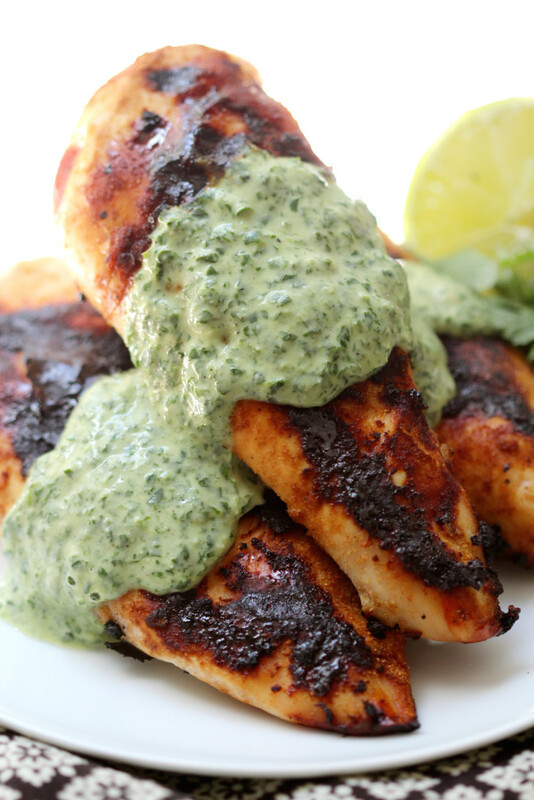 When everything is done, simply serve each chicken breast with desired amount of sauce. Enjoy! And now you see how sad it is that I am grill-less 😛 I guess it’s time to remedy the situation. Or maybe I should invest in a cast iron grill pan? Do you have one of those? They seem pretty handy for those winter months. I do have my mini George Foreman grill, but it’s super mini and I don’t trust it to cook poultry. I just use it to grill veggies and sandwiches. At least I had still make this sauce and use it on some boring over-baked chicken 😛 So grill or not, make this chicken and this sauce; you won’t regret it! + Gas grill or charcoal grill? I don’t care at this point. I just want one working! + Have you ever had authentic Green Goddess Dressing or have you made your own? I just found your blog and this chicken looks amazing. I don’t have a grill can I bake them? This looks so delicious, I adore coriander! How delicious is this dish! Oh this recipe sounds so perfectly balanced in flavors! Your photos are drool worth. I look forward to making dish! Another wonderful recipe. I love all the Indian spices and the sauce looks great! The sauce looks amazing! I’m always looking for new sauces to dress up chicken breasts. Just bought some tahini so I’m all set! Pinning! Woohoo! Rock the tahini! Seriously one of the best things for chicken! I love the coconut milk to make it creamy. 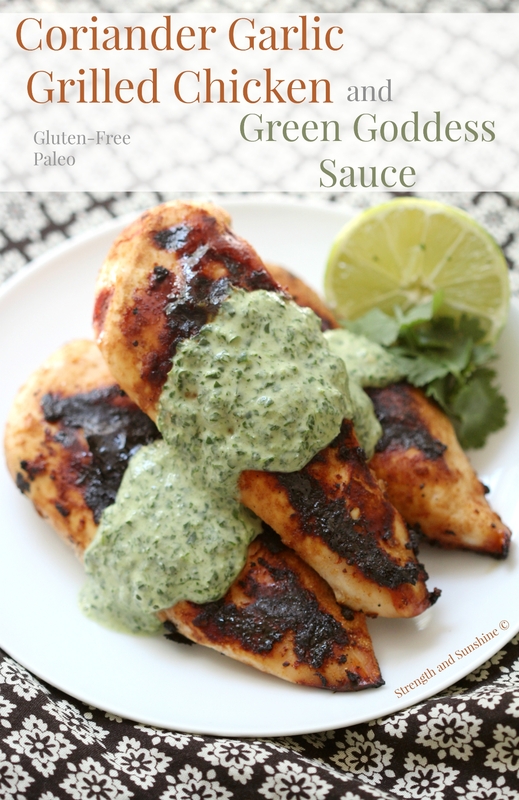 When I eat Paleo I always miss creamy sauces and they comfort that they provide me! Thanks for making me not feel like I’m depriving myself when I cook. Coconut milk is a life savor! This sauce is good for anything! I know! The real one sounds….nasty, hahahaha! I’m so excited to make this recipe! I get so stuck on using the same flavors and preparation for my poultry. The boyfriend will thank you haha! Never get stuck!! Chicken goes with any and every flavor! Wish I had a bite of this awesome chicken and sauce right now, well I probably won’t stop with just one bite. Time to make it then! This dish is such a winner! Thank you Sally! Yum, definitely want to try this! Featuring your recipe! This dish looks delicious especially with the sauce. I like the combination of fresh ingredients. 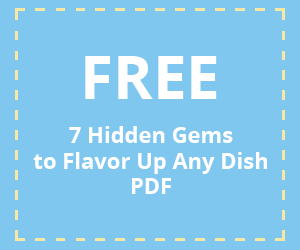 Found your post on Happiness Is Homemade! I am the simple and basic in my eating. Except this is a home run with that sauce. I really will have to do. The green goddess sauce sounds so tasty! I definitely want to make it. It’s a crazy awesome topping for anything! What a cool idea – I’m always looking for ways to use my fenugreek. Thanks! It’s such a forgotten spice! This looks so delicious! I love the mix of the kicky coriander with that cool sauce, yum! This sounds delicious and filled with so many healthy herbs and spices. I love chicken and this recipe is fit for a king. 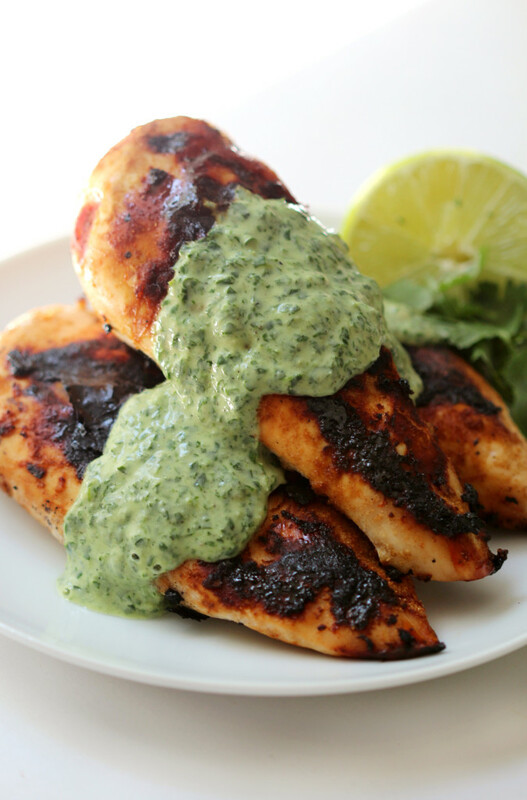 I love Green Goddess dressing, but rarely have it…this looks delicious! This one is so easy to whip up! This looks lovely and for me, I have been in search of a great recipe for green goddess sauce! Coriander is one of the most flavoursome herbs and I look forward to trying this out. I hope you do then! I know you’ll love it! As for grill types, gas grills are so much easier but I love the taste of food cooked over charcoal or wood! I love your blog I can always count on something unique. I love coriander! It’s one of those spices that makes a dish taste extra special, and has that “what is that? !” flavor. Totally! So many people don’t even know what it is! OMG it looks great! and i learned so many new things…..soy marshmallows…green goddess dressing…..coriander! 🙂 I might have to use this for my last great grilling session of the season. Nothing is better than that smokey taste! Such comfort! I wouldn’t know, but yes, tahini rocks! 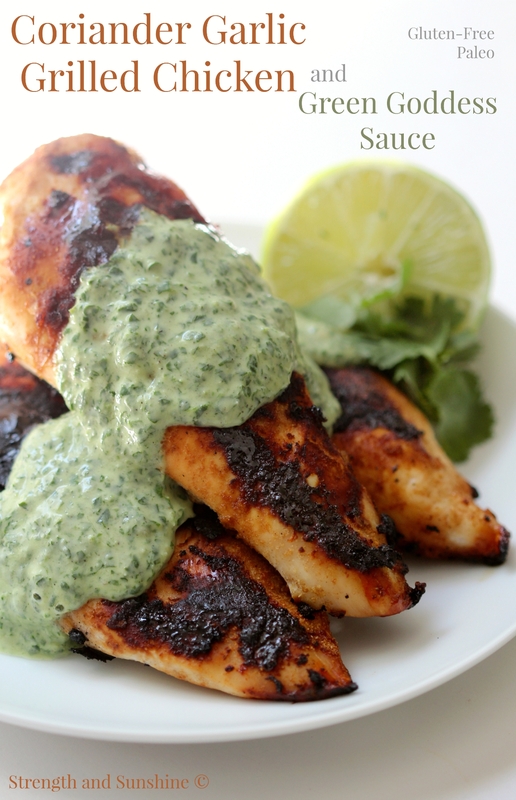 First off, your version of the green goddess sauce looks delicious. Love the twist with the coconut! And second, definitely try a grill pan. I have a Staub, and I love it. We use it in the winter months (well, when we live in cold climates, anyway). 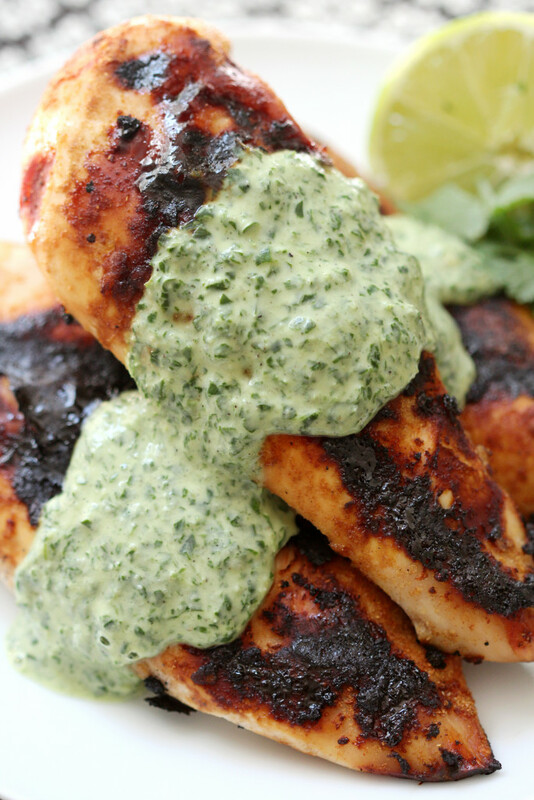 Grilled chicken all year ’round! I always find it hard to be creative with chicken although I enjoy the taste. This sauce looks delicious and definitely worth a try. There are so many ways to make chicken fun, I think that’s why people find it hard to play up! Chicken is the worst thing to photograph! Hahaha! This recipe looks amazing. I will have to put it in my to try pile. Pinned for later. Thanks for sharing! Oh man that sauce! I feel like I would just eat it by the spoonful. And that it would taste good on everything! I think I;m going to have to make that soon . . .
YUM! This chicken recipe looks like it’s just PACKED with flavor. I’ve never cooked with fenugreek, but I’ve heard it has somewhat of a maple flavor. It’s hard to place the flavor. Definitely an under-tone and nothing pronounced. Kind of like Turmeric in that fact that it’s a hard flavor to explain! I happen to have a working grill, a fire pit, AND a stand mixer! 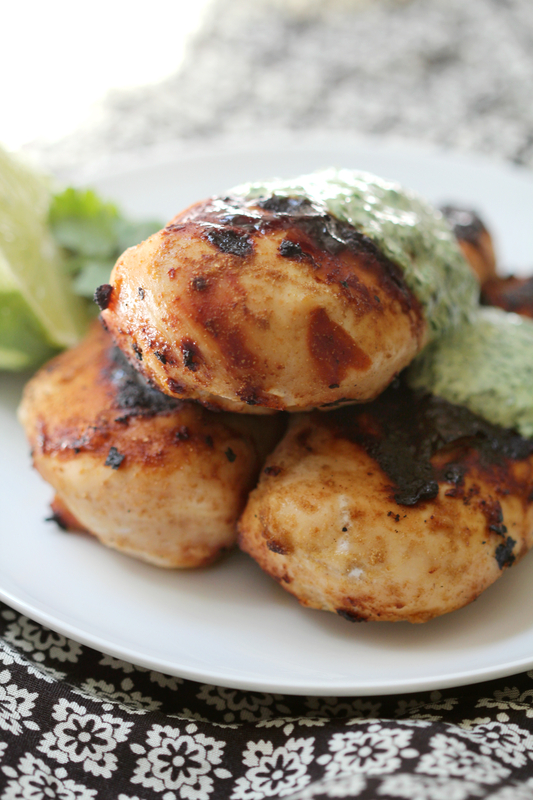 Come on over and we can grill up this delicious chicken and have marshmallows for dessert! Hahaha, thank you so much Cynthia! Enjoy every bite! I’ve only had green goddess dressing once, and it was the bottled kind (I think it was even Kraft or something like that that I wouldn’t go near now) and it tasted just like ranch dressing to me. Except the green-ness…although I wouldn’t put it past them to use food coloring :/ So yeah…I need to make it myself! Ps your site is so clean and pretty too! 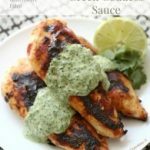 This green goddess sauce looks amazing!!!! I’m making this recipe this weekend. I just posted a zucchini boat recipe that calls for tahini – I wish I would have saw your post before I published , I could have included your sauce in the “other ways to use tahini” bit. Ps great photos too! That sauce looks amazing!!! I can see it on fish too! This chicken looks so good! I am going to need to save this to try later! 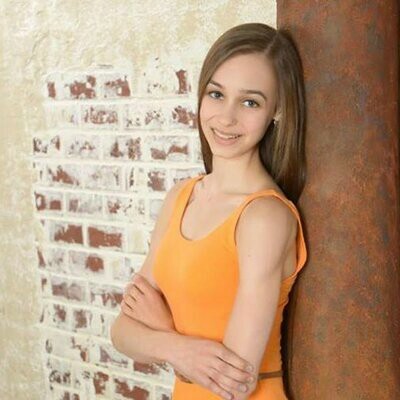 Thanks Marye! I hope you do! Coriander is one of my FAVORITE flavors ever! And with that sauce? This dinner sounds like a MAJOR MAJOR winner! Pinned! It is great! I forget about it, but then fall in love again! How awesome this recipe looks! I rarely use coriander and fenugrek spice, but I probably should. I have a fire pit but we don’t use it at all in the summer! Too hot to even sit outside let alone near a fire haha. I love grilling season and wish I had a grill at school. I love that you used fenugreek. That is a flavor you rarely see in recipes other than Indian. My husband would absolutely devour this chicken, but he would have to fight my daughter and I for it. Fenugreek goes such a long way for such a small amount, but it pairs so well with coriander, it was a must!